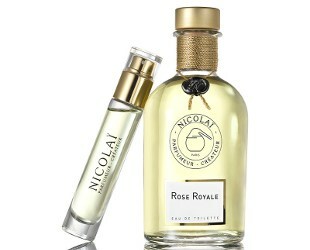 Earlier this year, French niche line Parfums de Nicolaï launched Rose Royale, a soliflore rose fragrance inspired by the gardens of Paris's Palais-Royal. Perfumer Patricia de Nicolaï, who developed it with her son Axel de Nicolaï, describes it as a "delicate" scent, a "natural and fresh rose with a hint of fruity notes." Rose Royale's notes include black currant bud, passion fruit, bergamot, rose, coriander, ambrette seed, immortelle, sandalwood, guaiac wood and musk. Sounds like a lot going on for a solifore, right? — but on my skin it made sense. Rose Royale opens with very light touch of bergamot and bitter black currant bud, but after that, it's not a fruity floral. Instead, there's a sharp green vegetal note and lots of ambrette, which I like to describe as "musky apple juice." I'm not really a fan of ambrette, so at this point, I'm not sure how I feel about Rose Royale in general. In the end, I enjoy this perfume more and more as it evolves and becomes part of me. The ambrette fades and makes my nose itch less. 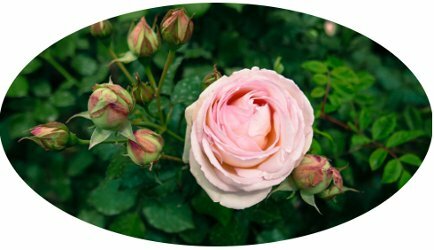 The damask rose becomes more dominant, with soft facets of spice and sweetness, and the eventual (and long-lasting) dry down is a gentle, very natural-smelling rose accord. That dry down stays very close to the skin, and it's muted yet refined, like classical music heard from a distance. Rose Royale doesn't feel as bold and commanding as its name suggests, and all in all, I prefer Nicolaï's Balkis (discontinued, alas). But it's a thoughtful, non-gimmicky tribute to the "queen of flowers," and it's quite reasonably priced by today's standards. If you're looking for a rose soliflore to add to your perfume collection, this might be one to consider. Patricia de Nicolaï has said that her new laboratory is located adjacent to the Palais-Royal, hence her love for its gardens. I'm looking forward to seeing what her next inspiration will be. Parfums de Nicolaï Rose Royale is available in 30 ($48) and 100 ml ($135) Eau de Toilette, or in a 15 ml travel spray with 250 ml refill (shown just above, €247). For purchasing information, see Parfums de Nicolaï under Perfume Houses. Note: top image is Rose at Le Palais Royal [cropped] by Aryeh Alex at flickr; some rights reserved. OMG! Since when does Nicolai have travel sprays? And as near as I can tell they do not sell them separately, which is too bad! Although 30 ml is still a decent size. I respect and appreciate this line, too (even though I miss Balkis!). Kiss Me Tender is one fragrance that I really do love. If you see this one around, give it a try! It’s not a soapy-clean rose like Diptyque Rose (which I think you like?) but it’s very graceful and non-trendy. At the moment I can’t really wear perfumes..do you ever get that moments? I know what you mean! I have those days once in a while… and then a candle or an incense paper is perfect! Great to see you reviewing this one, Jessica. I own a 30 ml bottle of Rose Royale and on my skin it smells like a very sheer, slightly cool pastel pink rose with a bittersweet black currant undertone. Quite simple, undemanding but very enjoyable too. Hello L! It’s definitely a “cool” and “pastel” rose, like you said — not a fiery rose or a dramatic rose or a deep rose! but I like it for what it is. Sometimes a pretty garden rose is what we all need. And the black currant adds just enough edge! Sounds like it is worth trying, especially with the 30-ml option and easy to split refill. FYI to those in the DC area. I’m at the US Botanic Garden and was happy to see in addition to three corpse flowers, the ylang ylang tree is in bloom and smells fantastic! Two of the corpse flowers are past peak. They took off the petals so that you can see the interior seeding parts, and the wilted petals are on a table where you can touch and sniff them. So I’m not seeing the full bloom (which will probably be Saturday or Sunday), but it is still super interesting and no line. Worth stopping by in the next couple of days, but keep in mind the line could be more than two hours long when the bloom opens. Nozkoz, It’s a very small world: I was recently part of a museum conference where I co-presented on a panel with the person who does all the interpretation and digital engagement (live videos, etc.) for the US Botanic Garden’s corpse flowers! I told him that we’re all big corpse flower fans here at NST, hah. That is so cool, Jessica! They really do a great job with the live cam and all the other materials on the website and on scene. There were also multiple staff with the plants explaining all about them, and they had jars of something designed to smell like the freshly opened bloom (i.e., something dead). It must have been a cool conference! Congratulations! I hope that you make it back for the full bloom.